In our home for festivals and function we usually make tomato Pachadi and MangoPachadi. Apart from that Fruit Pachadi is a rich traditional dish served at Tamil weddings and big function. 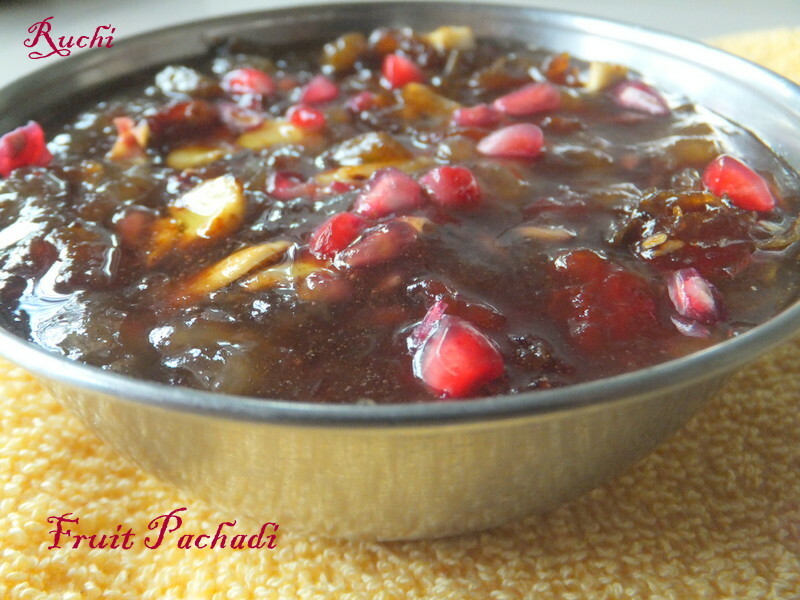 For Fruit Pachadi we can use availability of fruits or our favorite fruits. This sweet Pachadi is one of my favorite dish. 1.Peel and cut the pineapple and mango into small pieces. Chop the grapes into half pieces. 2.Wash and chop the tomato into small pieces. Slice banana and keep aside. 3.To a heavy-bottomed vessel add sugar and water and prepare sugar syrup into one string consistency. 4. Add chopped tomatoes, sliced banana, seedless grapes, mango pieces,pomegranate, and pineapple pieces into sugar syrup and stir well on a low flame. 5.Cook until it begins to leave the sides and reach a pachadi consistency. 6.Add the dates, cashew nuts, raisins separately and Mix well. I love each and every ingredient in this dish!! !so will love the dish for sure. my fav pachadi.. looks yummy.. Thank you girls for your lovely comments...:) Keep Visiting !! !